Four teenage girls were killed at around 10am, Monday 28th December when a hired truck carrying 50 students returning to Wewak rolled back down a hill and crashed. The incident happened after the vehicle they were traveling suffered mechanical problems and could not climb a hill and rolled back with all passenger on board. 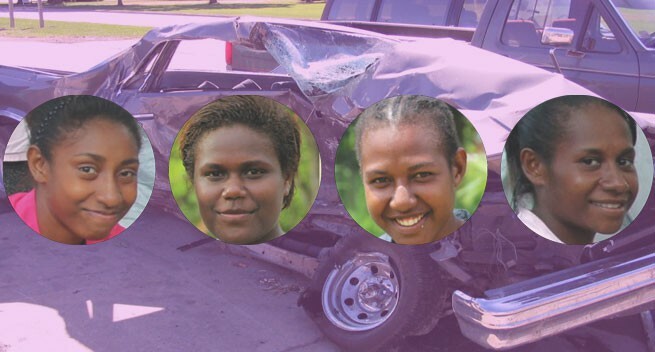 Four students, all girls, were killed instantly. Over 40 students escaped with their lives, sustaining injuries as they jumped from the truck. A further 12 are in critical condition at Boram – the provincial General Hospital for East Sepik Province. The extent of the serious injuries suffered by our young students include internal bleeding from damage to livers and spleens, multiple broken bones, paralysis from spinal cord damage, broken jaw, head injuries etc. Unfortunately Boram hospital does not have the capacity to treat the injured. Many of the injured will not be able to commence studies in the 2016 academic year and some of them will have their education permanently disrupted. Over K200,000 is now required to pay for burial expenses and to transport the injured to Port Moresby for proper treatment. Relatives and members of the public who wish to aid with financial contributions can send to the following account. For more information please contact: Tony Walwal on (675) 727 19 705 or Des Yaninen on (675) 733 20 558.